And now the moment many of who have been waiting for, the unveiling of just who our champion is. It is my pleasure to introduce to you Solange Hommel…aka BonsaiBabe. Solange has won a free pass to the 2017 DFW Conference. Solange is a retired teacher, newly transplanted to central Texas from northern Minnesota by way of southern California. 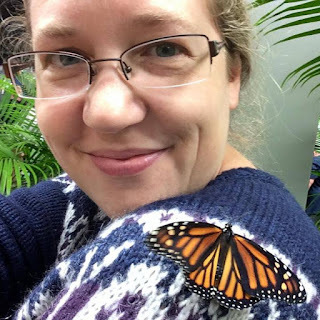 She writes mostly contemporary short stories and flash fiction, although she also has a novel of dubious quality lurking in a desk drawer thanks to NaNoWriMo 2011. Write Club 2016 has been her most exhilarating and informative attempt at sharing her writing with the big, bad world. She credits her husband and several four-legged roommates for keeping her sane. Our runner up...The Night Songstress...is none other than Joy Lucas. And there you have it. Congratulations to both of our finalist, and a virtual high-five to Solange for becoming the sixth member of an elite club - WRiTE CLUB champ. I want to again thank all 95 contestants who submitted their work for scrutiny this year, everyone who blogged, Tweeted, updated their Facebook status, or did whatever they could to spread the word about WRiTE CLUB so we could provide the exposure to these writers they so richly deserve, and finally I want to thank my wife Kim -- without who's support this contest would be impossible. I want to now give the contestants who feel so inclined an opportunity to reveal their own identity. You may not have won the contest, but as I've said many time before, just making it into the ring is high praise in and of itself, and you should bask in that limelight. So I encourage as many of you as possible to let others who you are and where they can read more of your writing! I'll be back Wednesday with a final few words and a 2016 wrap up. See you then. Thank you! The competition was fierce this year! I am in awe of all the great writers I've come across thanks to DL! It was such a blast to be at the DFW Writers' Conference. I loved meeting DL and Joy (and those of you who introduced yourselves Sunday after lunch when my brain was simultaneously vibrating with excitement and numb from lack of sleep! I'm sorry I wasn't more interactive.) 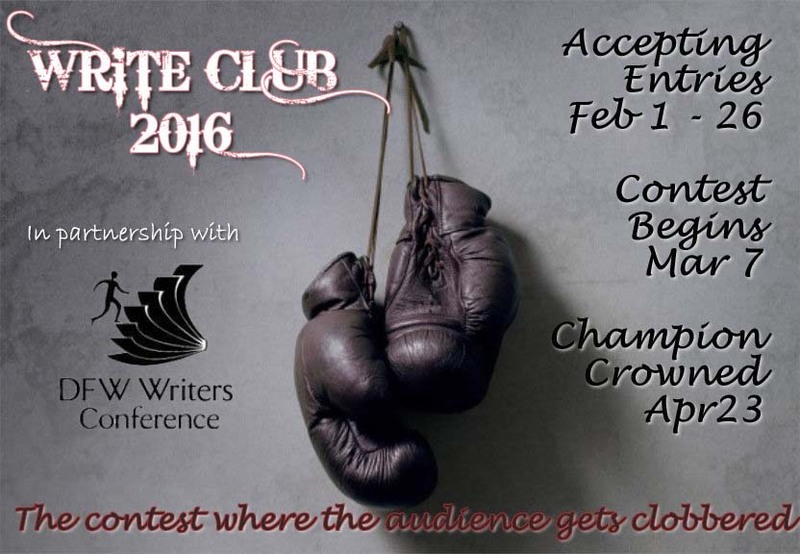 I can't wait to get to know all the amazing writers who participated in Write Club 2016! Please let me know who you are on Twitter -- my new favorite place to stalk...erm...follow inspiring writers -- so I can see more of your work! I'm @solhom. Who's already planning what they will submit next year?? Thank you! I was just one of many amazing writers! Each time I saw who I was paired with I thought, "There's no way I can beat that!" Thanks! I really enjoyed reading your pieces. You had me sweating bullets in our Play-off round after your amazing Cage Match results! @Solange Yay! Mega congratulations and Kermit the Frog arm flailing! @Joy: SO looking forward to more of your story. Looking forward to reading it. @Melissa Embry: Heeyyyyy Hunley! Your writing is amazing. Thanks! I could barely breath during the week that our Semi-final round was up. I would love to read more of both of the stories you excerpted. They're just my cup of tea! Thank you so much! Helveticaw is a seriously special story that needs to get published if it hasn't yet. Congratulations to both Solange and Joy! Thank you again to DL, Kim, the judges, the slush readers, and the writers for sharing! I was writing under the pen name Chun-Li. I'd love to connect with the rest of you--both contestants and commenters! 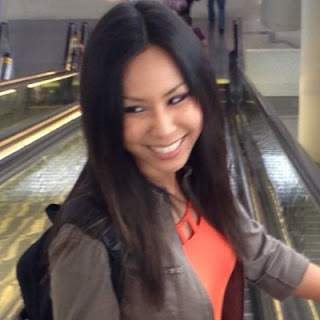 You can find me at @gloriacchao and/or gloriachao.wordpress.com. Looking forward to putting faces to pen names! May I suggest that writers who are on Twitter tweet, "Pen name:_______ #WriteClub2016," so others can find and easily follow? Congratulations to Solange and Joy! The competition was fierce this year. Congratulations to Solange and Joy! A huge thank you to DL, Kim, judges, and all those who tirelessly read and commented each day. It was a fun learning experience. My pseudonym was Pen-Book. @hemapen on Twitter. Look forward to connecting with all the other contestants (and commenters)! I echo Solange's thoughts. There are so many amazing storytellers and writers in this competition. I feel like a #writeclub2016 family formed and I was thrilled to have met some of you in person at the conference. That was truly the highlight of the event, in addition to attending classes by previous write club winner, Tex. Lisa Dunn -- your idea of the tweet is great! I want to follow everyone. I will be back next year as a voter and hope everyone comes back too. The feedback I've received has been invaluable and I wish for more online competitions like this. Thank you again, DL. I can't say it enough. Thanks everyone for your feedback!!! Congrats to Solange for winning and of course all the amazing and talented writers that made it through! It was inspiring reading through all the entries and I loved the support and sense of community that was fostered out of this competition. Congrats to both Solange and Joy! You both are amazing writers! All the writers were great, and it's nice to get to know the authors behind the pen names. And Joy, I loved meeting you yesterday. DL, I also enjoyed meeting you this weekend. Thank you to you and your wife for running an awesome competition! I was Parchment Princess, and my Twitter handle is @ck_laughlin. I look forward to following all of you on Twitter - I would love to know more about your writing/novels. Congratulations BonsaiBabe Solange Hommel. And way to go to everyone who took part this year. I've got some coffee over to drink because... I'm JavaInMe. The wereturkeys were originally from a mock-research paper. (Popular among a dozen students I wrote it for as a teaching tool.) I tried turning it into a story here, but obviously that didn't work out. Live and learn! Sunday, on my blog, I'll have my other entry posted. Come on by and check it out! Congratulations to both the finalists and especially the winner - the first time I've voted for somebody who has gone on to win! Congratulations to everyone who entered - you are all brilliant writers, keep up the good work. Congratulations to the winners. And thank you to DL, his wife (do we have a wife name? ), and the judges. Let's not forget everyone who entered. I know its not always easy to put yourself out there.